It has been a while, since my last post, I try to come to this blogsite at times to release whatever pent up musings I usually think I have, but...unsurprisingly, I find myself at war with my own brains. Should I write about the global warming (boring)? Or should I state my points about why I would rather be a night owl for the rest of my life? Maybe write about pilates, the body exercise I have been learning and trying to do every day for the rest of my life? Tonight though, while I was in the bathroom ( I tried to edit this to put me somewhere mind stimulating, but realized its just mental torture), doing whatever it is people do in the toilet where they flush afterwards. I know! Im obnoxious. Well skip that. I'll just go straight to the point. I thought about sounds in particular. Yup. Sound obssessed I am. I thought that I should blog about my cute lil not-so-little-anymore pet tortoise, named Merlin. He's so quiet that the only sign that I know of his existence is solely because I am the pet owner so I should know. But seriously, you do not hear tortoises moving about at night, passing your house, making some sort of identifiable sounds. So unlike cats, dogs or even wolfs. Even snakes hiss.ssss. My mom's snake phobic by just reading the last sentence, I bet she would freak out. For the reasons that I find tortoises very peaceful is why being me, I will blog about my tortoise Merlin. Merlin is a he, a male. I found out about the gender of a tortoise by googling: How do you tell if my tortoise is male or female? Bless google, through several websites and images analysis of tortoises rear end, I picked up my slightly grown tortoise then and checked his tail. Let me share the facts with you according to this site, the female tortoise has a short tail in a triangular shape and most of the time, their bottom shell is flat though in rare cases it could be slightly concave. The male tortoise has a longer tail and usually flicks its tail to one side with bottom shell concave in appearance. The concave bottom shell for the male tortoise is built to fit the female top shell during mating. 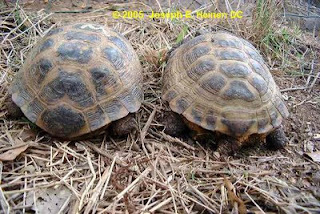 Next image shows the difference in the top shell shape of both male and female tortoises. Try to guess which is which. I have read on some forum on tortoise privacy, some of you may not be comfortable with such graphic contents but not to disrespect any of the members of the tortoise species and some of the human too, the image here is for learning purposes. So, did you make your guess already? The answer is..............the left tortoise with the extended top shell that touches the ground is the male tortoise while the female is on his right. Nice way of learning the tiny little details about this exotic animal species. And again I am sorry that I could not post any pictures of Merlin's tail area. But, I might browse some of the old younger-day pictures of him and put them up here. Merlin has been with me since he was as tiny as a Malaysian 50cent coin. I remember buying him at a pet shop in Giant, Senawang. There were many many duplicates of him, but I chose the quiet little sleepy one that sat at a corner of its container. I remember once after I had transferred him into a container that I made from Moms old microwavable plastic into Merlin's crib, I came home to check on him and he did not move an inch, even as I screamed his name a few times. He was so tiny, there was no sign that he was breathing. A sleeping kitten, wound make breathing noises, but a baby tortoise did not make any sounds at all. All the sounds that you could hear would be coming from me hyperventilating, screaming and finally tossing him this and that way. I am ashamed to say that I picked the poor little darling up and roll him down in the water part of his crib and screamed his name a few times, with an acceptance that maybe he really was no longer with me. I was about to cry when finally I saw some tiny little movements, a slow draggy opening of one eye, a slow stretch of one leg hidden under his tiny shell. HE IS ALIVEEEEEEEEEEEEEEEEEEEEEEEEEEEEEEEEEEEE! bless the heaven! Yes I was so excited and grateful, you would think I had just given birth to my own baby. But what do i know about birth giving, that's just me trying to fill up some gaps and be a wee bit dramatic. Cancel that. I did google about how to rouse your little baby tortoise though only afterwards, It was said that just by using a finger, a gentle rub on the sole of your baby tortoises' feet, would wake the cute tiny thing up. 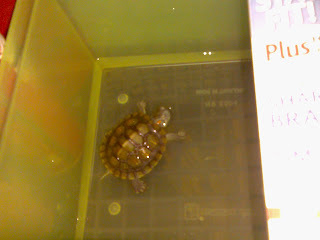 So, do not be like me and start to throw a deep-sleeping baby tortoise in a pool of water. If he had words and the ability to use them, he would be cursing, just like you, when somebody splashes some amount of water on you while you're sleeping. Here, We're talking the kind of cursing when you are actually thrown into a pool of water while you are asleep! Now, Merlin is bigger than my palm and he has long left his baby-crib and the teenage-hide-out. I have placed him in this big pot outside of the house with some water but not too much. I used to have a tortoise back in the days before Merlin that went missing because the tortoise pot was exposed to rain water and it overflooded, taking the tortoise along with it. Lesson learned. The image below is of Merlin during his years with me in college, yep he studied too while I pursued my degree, and I wonder if he too, like me, misses all those years back in that sauna-like room I had in college. I think its always been too bright for him but again, because he could not complain except by doing the thing he does with his legs, when he gets upset or excited, I cant say. I'll post the latest picture of him next time. I think I have totally missed the point of the writing, which was supposed to be about noises/sounds, but there will always be another post. And I am sure this is far more interesting than me complaining about sounds. Ohwell..ta-ta. Keep loving your life. Even though some days are always shittier than others.